Habitat: Upland. 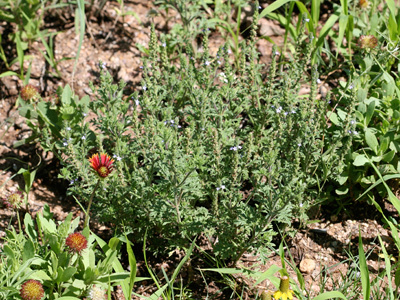 This relatively inconspicuous wildflower can be found growing on rocky slopes and in canyons, desert grasslands, chaparral, and oak-pine-juniper woodlands. Description: The very small flowers are in long, slender (less than 1 cm wide), erect, minutely stipitate-glandular flower spikes. 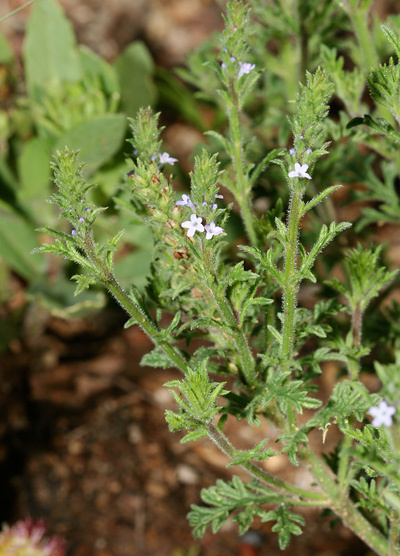 The individual flowers are tubular and have a 2-lobed upper lip, a 3-lobed lower lip, a somewhat hairy, white throat, and conspicuous, elongated, linear-lanceolate, green floral bracts. The flowers are followed by small, dry seed capsules. The leaves are small, green, hairy, opposite, egg-shaped in outline, and deeply toothed or pinnately lobed. 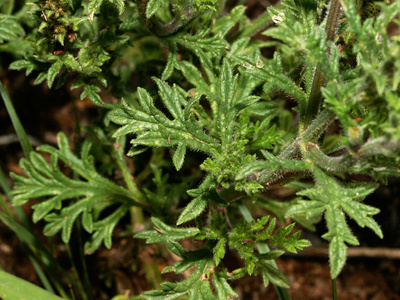 The stems are green, covered with bristly hairs, minutely stipitate-glandular, slender, well-branched, and prostrate, decumbent, or somewhat ascending. 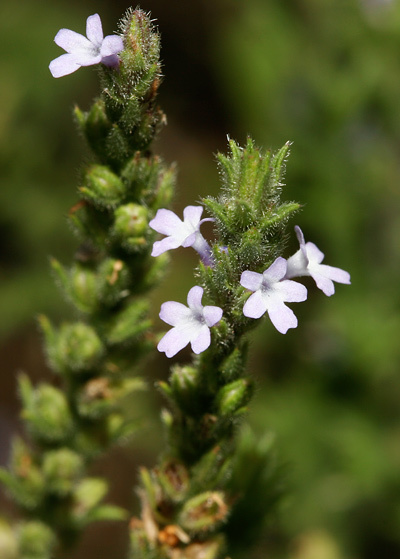 The similar Bigbract Verbena (Verbena bracteata) also has very small flowers and prostrate stems, but it has larger, more leaflike floral bracts, fatter (more than 1 cm wide) flower spikes, and foliage that is not conspicuously glandular.